This post is part of the 2017 Homeschooling Through the Holidays series and was written by Katie from Paradise Praises. There is nothing as magical, or as tiring, as a busy Christmas season. If we’re not careful we can add so many unnecessary extras to our schedules and budgets that it becomes more of a rat race than a restful holiday. And when we’re tired, our attitude and responses tend to be the first things we let slip, further marring the peace of the season we’re supposed to be experiencing. 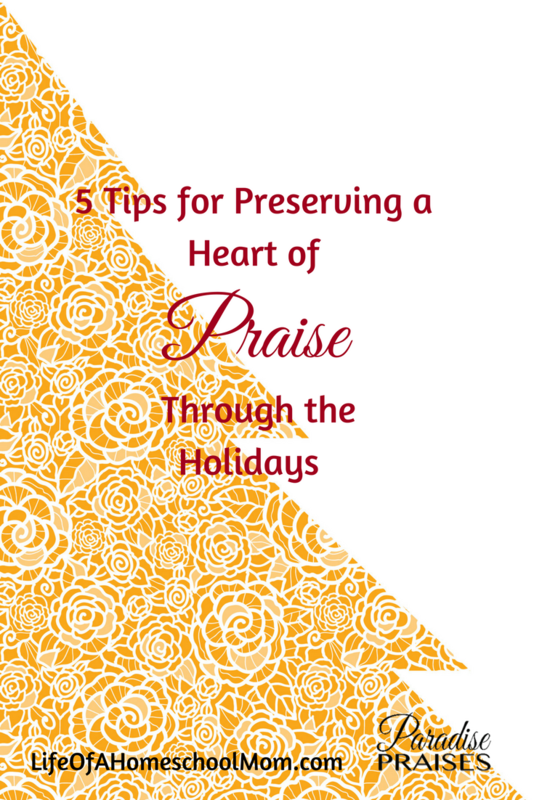 One of the best ways to keep your heart in praise mode through the holidays is to be sure you’re getting enough rest and to consciously guard your calendar and commitments so you, and your family, don’t exhaust yourselves. When life gets busy, the first things we moms tend to let go is our time. Our quiet time, our devotional time, our self-care, whatever you call it. The priority of meditating on Scripture and WHO God is and what that means for you today must not lapse if you want to keep a heart of praise through the busy holidays. Keeping the main thing, the main thing, is important. What is Christmas all about anyway? Coming together as a family to celebrate the birth of our Savior, and the new life he brings to all. So be sure to take time to focus on Him and spend time with your family. Adopt a meaningful Christ-centered family tradition. Read these books and the Christmas story with your kids. The decor, the parties, the gifts, the outfits… it’s all secondary to Main Things. Make time for the main things and fit the others in as you can. Even when we see a glass half full of water, science tells us it’s actually full to the top. The part we see as “empty” is actually filled by air that we cannot see. No matter what your circumstance this Christmas, choosing to see the “full-ness” of it will keep your holidays bright. Instead of dwelling on what you don’t have, can’t afford, didn’t receive, etc you can choose to be thankful instead for all of the blessings you have received. When I count my blessings I find my perspective changes as so many of them are much more than I really deserve. Whether words of affirmation are your love language or not, everyone likes to be praised, acknowledged for something you did, or did well, thanked for gift or thoughtfulness, or encouraged in a hard time. Being quick to praise those around you during the holidays, not only blesses them, but also often diffuses situations that can be shall we say, “holiday-tense”. Someone makes a mistake – applaud their effort and ask if you can help, or help them figure out what went wrong so it can be done better next time. Someone is upset or disappointed that an expectation was not met – help them see the good, look for the silver lining in the situation. Nothing pleases our Savior more, as we celebrate his birthday, than when we speak life to one another, praising each other and praising him for his abundant goodness to us, in every situation. 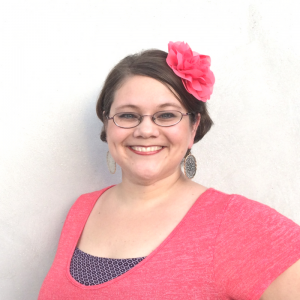 Katie Hornor‘s new book In Spite of Myself: How Intentional Praise Can Transform Your Heart and Home just released and stems from the lessons she’s learned in choosing to praise, intentionally, as a wife, expat, homeschool parent and business owner. Click here for information on the book, and to learn how to join Katie for a free live 4-week Bible study on Praise. Pinned! Thanks for the timely advice on praise. Merry Christmas!